Choose appropriate size, for right or left foot. Slip Gel ‘ring’ over 2nd toe. 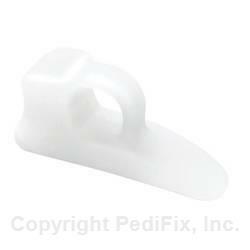 Adjust Spacer position between and under 1st, 2nd and 3rd toes. Wear only for a few hours per day to start, gradually increasing wearing time. Remove at night. Hand wash. Air dry completely before reuse. Sprinkle with powder if gel becomes tacky. If you have diabetes or poor circulation, consult your physician before using. If numbness, discoloration, irritation or additional pain occurs, discontinue use immediately. If symptoms persist, visit a healthcare professional. Remove for at least four hours per day.